If you are a regular reader of my blog, you may have noticed that I have started a collection of tiny ball jointed dolls or BJDs. 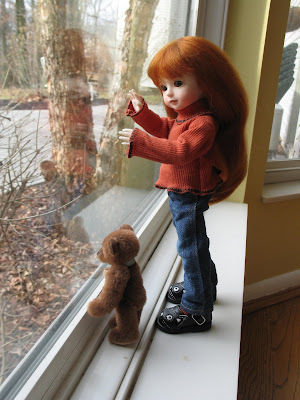 (On the BJD forums, dolls 30cm or less are called "tiny" since BJDs come as large as 70cm.) I purchased my first in October of 2008, and last year added four more to my collection, including this adorable doll which my husband Sean bought me for Christmas. These posable resin dolls are no ordinary collectible; they are yet another opportunity to exercise my creative muscle! They can be purchased undressed, unpainted, and bald for dressing, painting, and "wigging", like a blank canvas to create a little personality from my own imagination. These little cuties have inspired me in other ways, too. 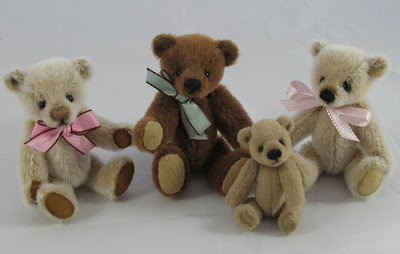 First, they have inspired me to revisit the world of miniature bear making. 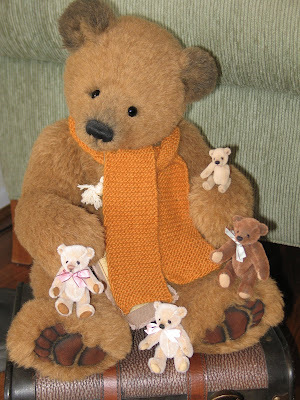 In my early years of bear crafting, I wanted to try everything, so I made a handful of miniature bears. As my skills grew, so did my bears, and I find that I enjoy making large armfuls of bear the most. But my little dolls needed bears didn't they? So I got some upholstry velvet, and had another go. To give an idea of the size of these little ones as compared to my typical work, here they are posed with my Paddington! 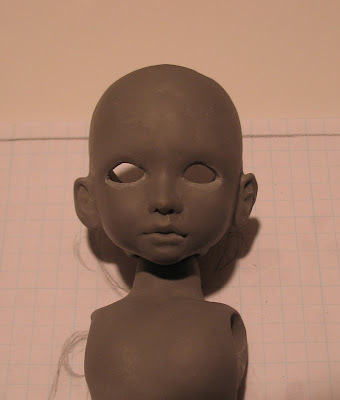 I have also been inspired to try my hand at sculpting my own tiny BJD! This is a big project, and I'll be working on it a little at a time, while I continue to make my bears, so expect periodic updates. Here is what I have so far. 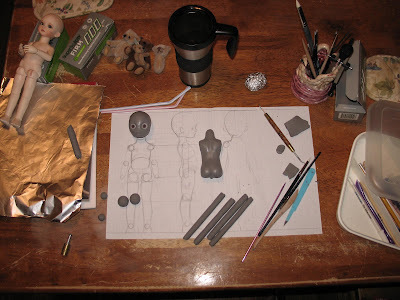 A drawing to serve as a map for the proportion, a cute torso, and an alien head! Here the head has been sculpted and hollowed out, and I've started to work on the legs. The legs and torso will be cut into pieces for the jointing, but I thought sculpting them as a whole would help me get the anatomy more accurate. The final thing that these tiny dolls have inspired me to do will remain a secret for now. The scope of the project is greater than anything I have yet created, but if it comes together as well as I can see it in my mind, it will combine all of my creative passions! Love the mini bears the are wonderful! 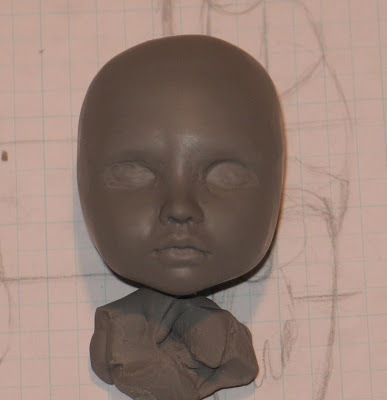 You've got a wonderful start on the BJD. I wish we lived closer to each other so I could sculpt with you. 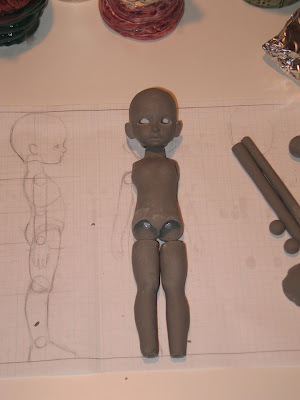 All my BJD efforts have seemed to take a back seat to other things. Seeing your progress really makes me want to try making one again. Thank you so much Heather and Lori. Lori, I'd love it if we could sculpt together. Maybe we could find another class to do. I try to take some sort of scukpting class each year. Oh my goodness! Another wonderful string to your bow! You've really got the hang of the sculpting, I wouldn't know where to start. It looks like you've been doing it years! Wow, from me too! You'd think you've been sculpting for years! I can't wait to see how she turns out. I must remember to pop back!